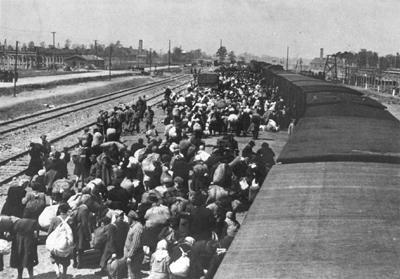 Holocaust Survivors: Photo Gallery - "Exiting Boxcars at Auschwitz-Birkenau"
From \"The Auschwitz Album\", the only photographic documentation of the entire extermination process at Auschwitz, the photographer has climbed on top of a boxcar to show the people with their bundles. On the left of the train tracks is the Lagerstrasse, the main camp street at Birkenau. Further to the left is the wooden hut which stands beside the gate which led to the main camp through which those selected to live would pass. In the background are the chimneys of Crematoria II and III to the left and right of the tracks. In the foreground a newly arrived prisoner converses with an inmate in striped camp clothing.